I was glad I picked this triad of books up for free, as I probably would have asked for my money back otherwise. Consisting of three books, The Enigma Strain (with a bonus few chapters of the next book in the series), The Atlantis Stone, and The Depths, the drastic need for an editor (or beta reader group) became apparent by the end of the collection. I’m almost a little disappointed that there were so many errors in proofreading and logic in these books since I would think they’d be cleaned up a bit from their first publications in order to be compiled together here. While I did finish these three books, I can probably blame The Enigma Strain for that fact. The first book in this collection, The Enigma Strain was a passable thriller, even if it was a little cliché and stereotypical. I was vastly more disappointed in The Atlantis Stone, which hardly made any coherent sense. With so many ill-defined characters running around, trying to meet an arbitrary deadline, it was painful to read. I hoped The Atlantis Stone was a fluke when I started The Depths, but its scientific continuity errors confirmed that the best book in this collection was the first one, and it all went downhill from there. Some of the ideas presented in these books seem interesting at first blush, but they’re muddled down in so many other unnecessary things that the plots generally devolve into a race against the clock. Perhaps with some additional research, attention to detail, and revisions, these books could be pretty good. 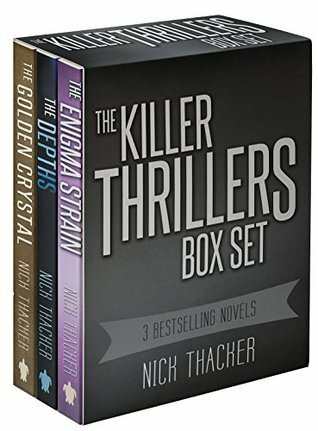 As they are now, they seem thrown together to earn a few bucks from people who throw money at any thriller with a somewhat intriguing cover and title. I’m just glad the only thing I wasted was my time. Three books that still need some work done on them, I give Killer Thrillers 2.0 stars out of 5.